Pulse several times to distribute ingredients, and then blend at high speed until smooth. Pour into a serving bowl, and add your toppings. 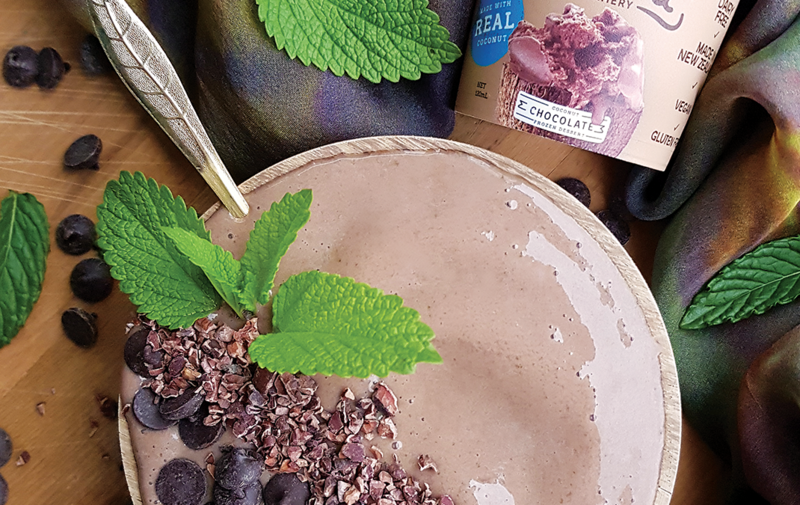 Pour your Milk of choice into your blender, followed by all other all ingredients (make sure that your frozen Banana is broken into small chunks!). Pulse several times, and then blend at high speed until smooth. Pour into a serving bowl, and add your toppings. 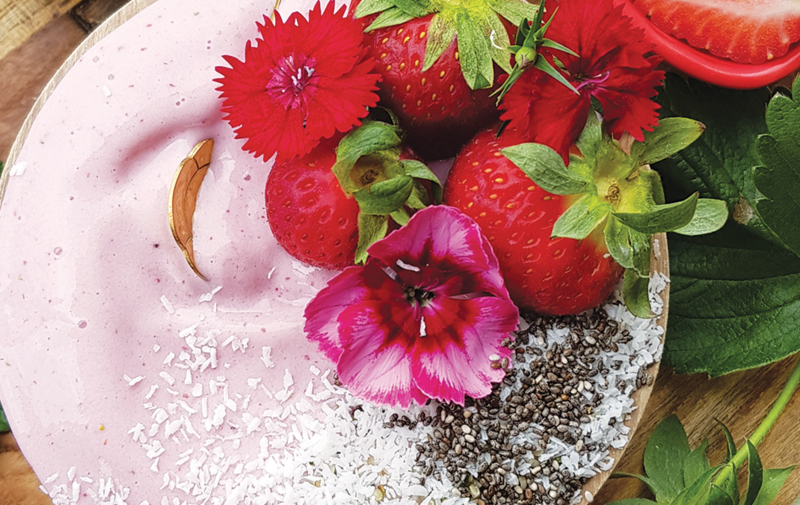 Strawberry Smoothie Bowl, Summertime, YUM! Place all ingredients in your blender. Pulse several times to distribute ingredients, and then blend at high speed until smooth. Pour into a serving bowl, and add your toppings. Celebrate the splendor of Spring with this sumptuous smoothie! After all the wait, Spring is finally here, beckoning all things good, like rays of light breaking in through the blinds in the morning, birds chirping their song and the sweet Summer breeze just around the corner. It’s the promise of all things good. We couldn’t be more excited. 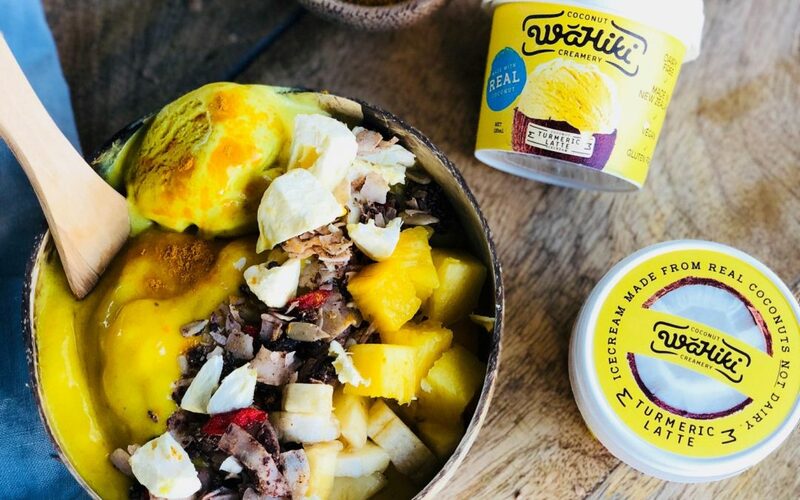 So we’ve created the ultimate smoothie with Wahiki’s Turmeric Latte ice cream, the first flavour of its kind in the world! When was the last time you had ice cream that had ginger, black pepper and cinnamon in it? Now you can! Imagine, superfoods in your ice cream! AND it’s dairy free, cruelty free, and certified gluten free! With only 9.4 grams of sugar per 100grams, this is the guiltless treat you’ve been waiting for. Feel good without feeling bad afterwards! 1.Add all ingredients into a high speed blender and process until smooth and thick. 2.Pour into you bowl or coconut bowl. 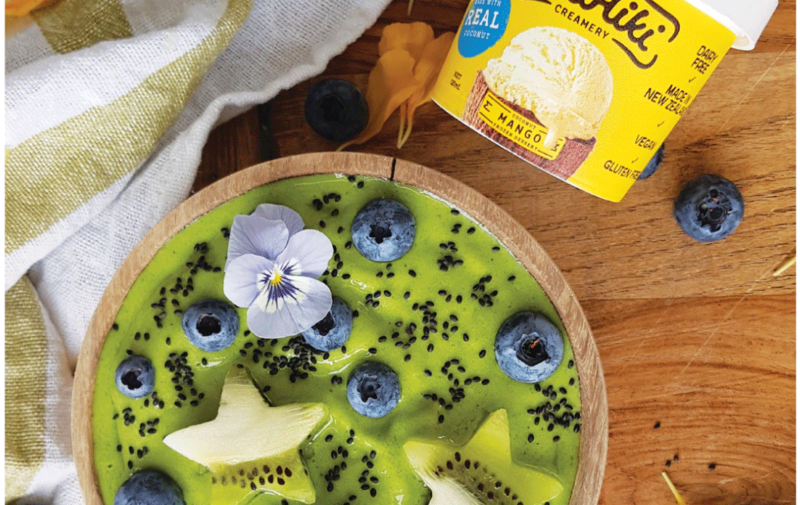 3.Topped with your favourite gluten free granola, fresh chopped pineapple or mango, sliced banana, a sprinkle of turmeric powder and a big scoop of Wahiki Turmeric Latte Coconut Ice Cream. Add all ingredients expect the water into a food processor and process until the mixture is all combined. Add the water in a table spoonful at a time and process a little longer until the mixture comes together (you made need to add one more table spoon of water if the consistency is to dry). Pour the mixture out and knead slightly, then shape into a ball. Wrap in cling film and place in the fridge while you make the coconut chocolate mousse filling. Grease a tart tin (ideally a removable base) with coconut oil. Remove the tart mixture from the cling film and place in the tart tin. Using your hands press the mixture evenly to cover the base and sides. Make sure that it is flush with the edges of the tin. Prick the pastry base with a fork and place in the oven for 10 minutes. Just keep an eye on it so it does not get too brown. Remove from the oven and set aside to fully cool before add your mousse mixture. Place your cashew nuts in a bowl and soak for at least four hours or overnight. Drain and rinse the soaked cashew nuts and place into a high speed blender. Add all the remaining ingredients and process until smooth and creamy. Place in the fridge while you cook the tart base. 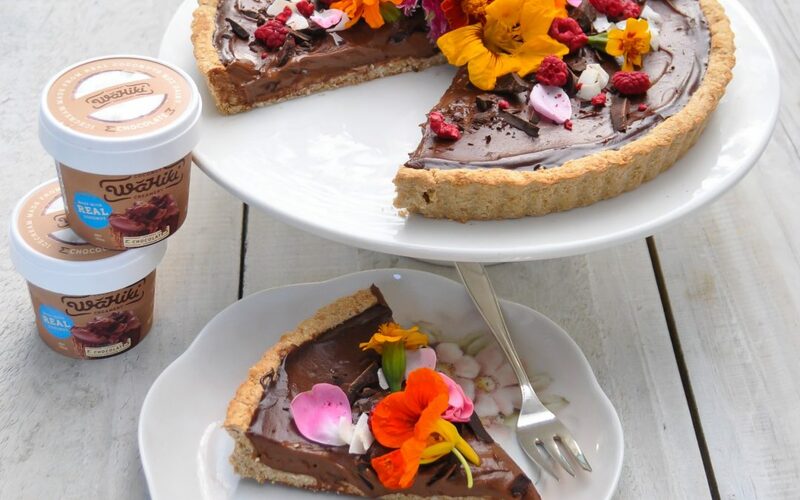 Once base is fully cooled, remove from the tart tin and pour in your Wahiki coconut chocolate mousse mixture. Spread evenly. Place in the fridge for up to two hours before serving. It will keep in the fridge for a couple of days (but probably will not last that long).